Paintstiks, Stencils & Suede: A Gorgeous Combination! In the middle of December, I holed up in my studio for a weekend and started playing with the suede I got from Bella Nonna Design Studio. Jayme and Megan have a new line of leather and suede, and Megan came to see me at the Houston Quilt Market to see if our Shiva Paintstiks would work with the leather. I found that the finished leathers were not terribly interesting — it’s difficult for the paint to adhere to the smooth finish. But the suede — oh my goodness — it’s nothing short of fabulous! You really have to give this a try. It’s beyond fun and the possibilities for the finished suede are endless. 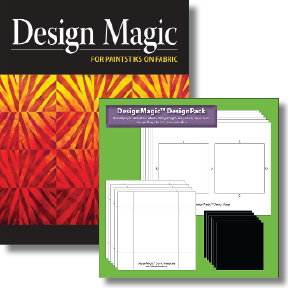 Design Magic: What is a Design Pack? Bernina Likes Shelly’s Magic Mats! 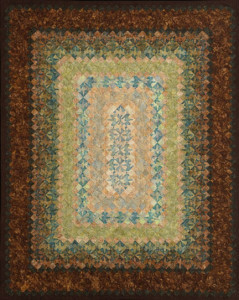 I just got a lovely note from a friend to tell me that Bernina is featuring my Magic Mats in Issue 4 of Through the Needle, a free online publication. I knew the article was coming, but it’s always a thrill to see one of my projects in print. Happy me! Because we have so many new people in our community, I want to share the Magic Mats tutorial that I posted last summer. Enjoy! Here’s a great little project for our DesignMagic stencils – or one of your own designs! 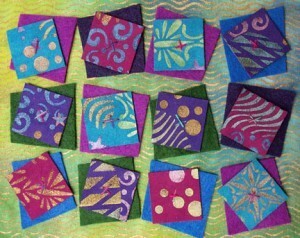 My Magic Mats pattern is the simplest way to make a placemat that I can think of. 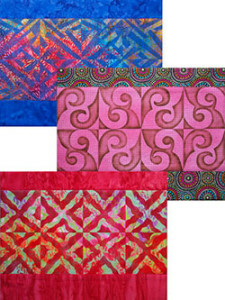 All you need is two pieces of fabric, some interfacing, one paintstik, one brush, and one pair of DesignMagic stencils. It’s easy!